Sarah: So things are better with Serena? Dan: Serena. Yeah ... yeah, good memory. Dan: Things are finally back to normal. Sarah: Good. Well, I mean, you know, it's tough making friends in a new city. It would be really nice to meet her. Dan: Yeah, Serena would love you. Chuck. Yes, I'm still fine. I haven't heard from Georgina in two weeks, so if you'd stop calling me I'd finally be rid of all of my monsters. Bye! Blair: My, my. If it isn't Little J, risen from the ashes? Jenny: I came to tell you in person. You win. Blair: Oh sweetie, we just started to play. Jenny: No, you don't understand. I'm done. With you, with them, all of it. Blair: Just like that, you wave the white flag. Jenny: I lied. And I stole and I lost the respect for my family. For what, so I can be like you? You asked me before if it was all worth it. And my answer is, it's not. Blair: I tried to warn you. There's a price to pay. I always knew a girl like you couldn't afford it. Jenny: Well you were right. Georgina: Aww c'mon, I'm just having a little fun. Permalink: This is not a game! Aww c'mon, I'm just having a little fun. Why would I tell everyone I know that I'm gay if I'm not? Permalink: Why would I tell everyone I know that I'm gay if I'm not? Eric: I mean, people thought that I was Gossip Girl. Serena: [laughs] You have to admit, it made sense at the time. Do you really think that someone like me would date someone like you, Jenny from Brooklyn? Lily: You know how I'd always love it when Georgina came around. Georgina: I ran into Lily in the lobby. You totally forgot to tell Lily I was coming for dinner! Lily: Where do you think your going? Serena: I can't talk right now Mom, I'll explain later. Lily: If you invite an old friend to our quiet family dinner, I expect you to stay and eat. Spotted, Jenny Humphrey wading in the Met fountain fishing for change. Blair Waldorf seen dallying with an off-duty doorman at the Blarney Stone on a Monday night. It looks like the battle between the Queen B and Little J has moved from the streets to the blogs. Who's sending this debasing dish? I have a feeling. 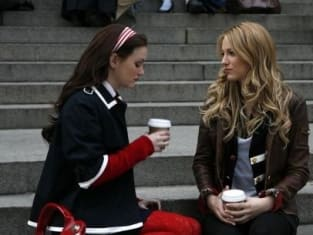 Blair: Serena, what are you doing here? It's late. Oh my God. What's happened? What's wrong? Talk to me. Blair: Of course you can. Serena: No. No, B, this is the one thing I can't tell you. I can't tell anyone. Blair: I'm not anyone, I'm me. You can tell me anything. Serena: No I can't. Because then that would make you a part of it. And you can't be a part of this. Blair: What are you talking about? You're starting to scare me. Hey, hey, hey. We're sisters. You're my family. What is you, is me. There's nothing you could ever say to make me let go. I love you. What is it?